A cooperative managing a surf camp in Dulag, Leyte, shared its blessings to their fellow Dulagnons in a turnover ceremony on Thursday. 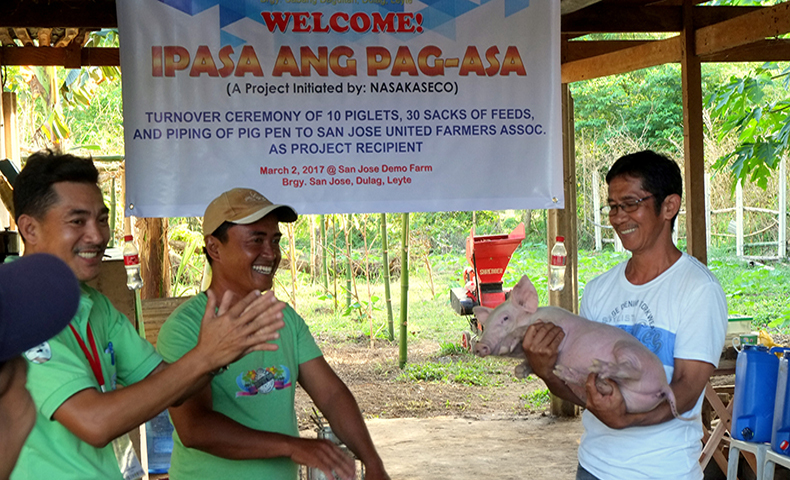 The Nagkaurusa nga Sabangnon Katilingan Service Cooperative (NASAKASECO), the cooperative managing the Sabang Daguitan Surf Camp, donated 10 pigs and sacks of animal feed to the San Jose United Farmers Association as part of the former's Ipasa ng Pag-asa initiative. ABS-CBN Lingkod Kapamilya Foundation's Bantay Kalikasan encourages partner organizations such sa NASAKASECO and those located 13 other provinces to set up an Ipasa ang Pag-asa Fund, which serves as a pass-it-forward scheme that will benefit other communities. The Sabang Daguitan Surf Camp is one of the successful projects in Leyte, with NASAKASECO earning almost PHP 1 milion in net income from its 2016 operations.